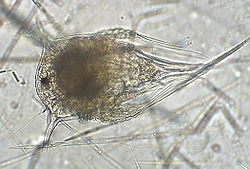 A nauplius (plural: nauplii) is the first larval form of most crustacea. It develops from the egg, and may be followed by later stages before the adult form is reached. In some groups there can be as many as nine larval stages. Sometimes the nauplius stage is passed through in the egg, and then a later stage emerges from the egg. ↑ 1.0 1.1 Robert Gurney (1942). 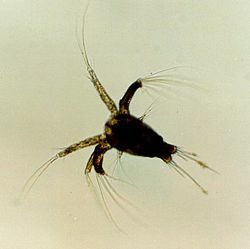 Larvae of decapod crustacea (PDF). London: Ray Society. pp. 1–306. This page was last changed on 3 January 2013, at 11:58.